Please welcome Tim Akers to The Qwillery. 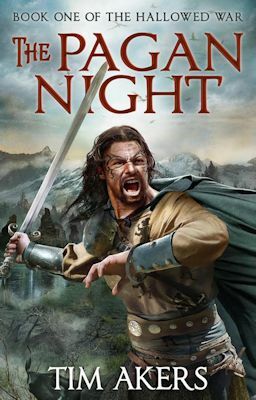 The Pagan Night was published on January 19th by Titan Books. Tim: First off, thanks for having me. Like most writers, I started as an avid reader. That was the birth of my imagination, and writers like Tolkien, Brooks and Alexander raised my creativity. My first serious attempts at writing started in the fifth grade, around the same time that I discovered roleplaying games. That’s when I fell in love with worldbuilding. Those two disciplines, gaming and writing, have always gone hand in hand for me. Tim: I have to say that I’m a hybrid. During the early stages of every book I spend a lot of time plotting, outlining, planning the narrative structure and the roles of each character. I want it to be balanced without looking like it’s been crafted. But once I start writing I throw most of that out. Without the road map I wouldn’t know where to go, but I refuse to be locked in to that path. I do a lot of discovery as I write, which then entails revising earlier work, or sometimes completely throwing things out. With The Pagan Night I threw out just as many words as I wrote. Maybe I’ll use them someday, maybe not. But without writing those words I wouldn’t have gotten to the ones that ended up in the book. Tim: Creative isolation. I’ve spent six years with this book in various forms and drafts, and over that time there are maybe ten people who have read the whole thing. For long periods of time that number was only three, if I include myself. It’s difficult to get the true measure of a work with so little feedback, even if the quality of that feedback was very good. I wish writing were a more open and communal process. On the other hand, I don’t want readers seeing the rough drafts. The final version of this book is so much better than those earlier forms, and I wouldn’t want to spoil that for anyone. It’s a balancing act. TQ: What has influenced your writing? Tim: I draw influence from a lot of different things. I’m fascinated by the evolution of religion and culture, their interaction and the feedback loop that interaction tends to create. Stylistically, there was a period of time when William Gibson influenced my writing so much that I had to work to purge it from my system. Same with China Miéville. I wasn’t really able to find success until I had developed my own voice, though, which mainly involved burying those influences deeply enough that readers stopped noticing. TQ: Describe The Pagan Night in 140 characters or less. Tim: Feral gods and mad inquisitors haunt the forests of the north, drawing the land of Tenumbra to the brink of war. Plus swordfights. TQ: Tell us something about The Pagan Night that is not found in the book description. Tim: The world is loosely based on England following the conquest, and features the integration of the Angles and the Saxons, rebranded as the countries of Tener and Suhdra. To help readers easily identify the allegiance of various characters, I’ve modeled all the Tenerran names after Scottish traditions, while the Suhdrin names are all French. I find it to be a handy guide without having to explicitly remind the reader who is who throughout the book. TQ: What appeals to you about writing Epic Fantasy? Tim: I like having the space to fully develop the story. You have to work to avoid narrative creep, but there’s greater tolerance for a fuller exploration of the world and the characters who inhabit it. I tend to write big stories, the kind of stories that end up with gods dying and kingdoms going to war and dark lords rising from the ashes of a doomed civilization. Epic fantasy is the perfect forum for that. TQ: What sort of research did you do for The Pagan Night? Tim: I read a lot of books about life in the middle ages, since that is the target time frame for my fictional world. From how peasants lived to how knights fought and kings waged war, I spent several years absorbing as much as I could about that period. Then I promptly put that information away, because I don’t want to overburden the story with absolute accuracy. It’s a novel, not a historical reenactment. TQ: In The Pagan Night who was the easiest character to write and why? The hardest and why? Tim: Easiest character has to have been Sir Elsa LaFey. She’s a knight of the winter vow, an order of warrior-priests dedicated to hunting and killing the mad gods of the north. In some ways she’s a very straightforward character, but her movement through the narrative is deeply interesting to me. Over the course of the three books we’re going to see her question her faith and her commitment to the rites of her order. Where she ends up may prove surprising, even to me. Hardest character must have been Sir Henri Volent. I won’t say a lot about him, other than to mention that he’s the champion of one of the book’s villains, and a deeply troubled soul. Though he is a man of violent action, his story is largely about his developing morality and the consequences to his master’s plans. He has some of the best lines in book, as well. TQ: Which question about The Pagan Night do you wish someone would ask? Ask it and answer it! 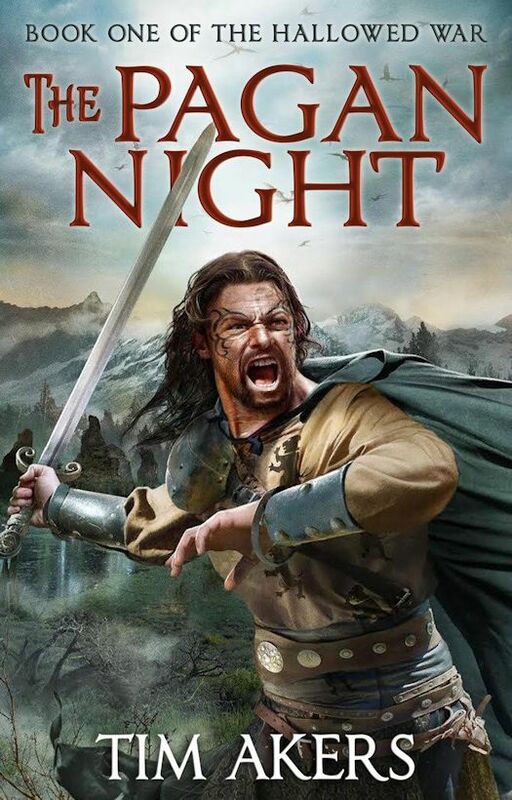 Tim: What makes this book different from the hundreds of GRRM knock offs? The depth and clarity of the worldbuilding. I’ve made a tremendous effort to layer the exposition and action together, so that you’re not faced with chunks of informational text followed by dizzying action. I honestly think good storytelling does both of these things simultaneously, mostly by grounding the narrative in interesting and believable characters. Done correctly, the writer is able to provide satisfying pacing, an immersive world, and creative and strange characters without the reader really noticing the craft of it. TQ: Give us one or two favorite non-spoilery quotes from The Pagan Night. Tim: Well, I have two more books to write in this series, each coming out a year apart. On top of that I tend to write another book a year, but due to contract shenanigans, I’m not sure when those will see the light of day. I have a series following an assassin who has a wraith bound to his soul, and another following OSS mages during World War Two. Who knows which of these will come out next. Tim: Thanks again for having me! It’s been a pleasure. Tim Akers was born in deeply rural North Carolina, the only son of a theologian. He is the author of the Burn Cycle from Solaris Books, as well as The Horns of Ruin, featuring Eva Forge, published by Pyr Books. This is his inaugural entry into epic fantasy. His new book, The Pagan Night, is out now.